We are all used to the traditional rectangular yoga mat or yoga towel. The traditional mat, though, comes with its own implications. Often, your feet will slip from the mat and you might not have enough room to do all of the poses without having to move from your mat. Or may you want to try out some two-person partner yoga poses. Square Yoga mats are the perfect solution to any problem you may be having with your current yoga mat. Below, you can find out all about these square yoga mats and why you should get one! The Manduka PRO Squared Yoga Mat is 72×72 inches large, which means you’ll have plenty of room to practice at any time of day. Not only this, but you can also have a family member or friend to practice with you and you won’t have to have two mats. If you’re one of the many people who enjoys practicing acro-yoga; that is, yoga with a partner, then Manduka’s mat is certainly the best one for you because you’ll have plenty of room for your partner and you to fall around on without worrying about getting hurt. The downside is that this mat costs about twice as much as a regular Manduka mat’s. That’s not surprising since its twice the size. However, however, the raving reviews on Amazon prove the mat’s reliability and excellence. It has a hardness that provides the perfect balance between comfort and support while you’re going through your asanas. For all of its many benefits, you’ll be getting your money’s worth with this mat. Square36 makes the largest available yoga mat at 8 feet by 6 feet. While not exactly square, this yoga mat still serves the purpose of providing a gigantic cushioned floor space. At 6mm thick, this yoga mat also provides plenty of cushioning. Anything higher than 6mm is usually not recommended for yoga, as you will lose support. At 13 pounds, this mat is no lightweight, but this is the type of mat you probably keep in your basement for working out. We don’t think this would be practical to lug to class – your class might not appreciate you hogging up all that space either! Square36 is a small company with great customer service. 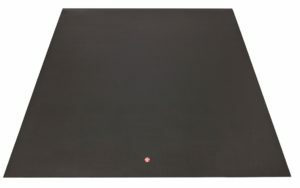 Note that this yoga mat will not be as durable as the natural rubber Manduka mats, and they recommend that you do NOT wear shoes when using this mat. However, it’s a great bargain for its size and our choice for best deal. If you’re looking for a cheaper alternative to the aforementioned Manduka yoga mat, then Yoga Direct’s Square Yoga Mat is definitely the one for you! This yoga mat is the same size as Manduka’s, but it’s much cheaper and it still has pretty good reviews on Amazon. Of course, you won’t get the quality and durability that comes with the Manduka name, but for a basic large mat at a fraction of the price, it’s a pretty good deal. 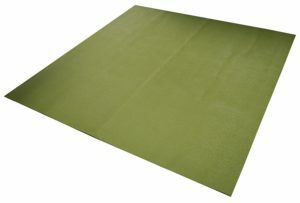 This yoga mat is also latex-free, so it’s both Eco-friendly and it’s ideal for people who have an allergy to latex. At twelve pounds, you can also carry the yoga mat around with you to classes, to work, etc. It might be a bit heavy to lug over your shoulder, though, so be sure to pack it in your car if you want to bring it with you. If you’re extra large, are into 2-person yoga, use yoga mats for calisthenics, or just want something big, consider a square yoga mat. The two options above give you a premium and budget choice from Amazon.